A siege is a military blockade of a city or fortress with the intent of conquering by attrition or assault. The term derives from sedere, Latin for "to sit". Generally speaking, siege warfare is a form of constant, low-intensity conflict characterized by one party holding a strong, static defensive position. Consequently, an opportunity for negotiation between combatants is not uncommon, as proximity and fluctuating advantage can encourage diplomacy. A siege occurs when an attacker encounters a city or fortress that cannot be easily taken by a coup de main and refuses to surrender. 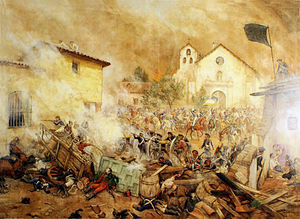 Sieges involve surrounding the target and blocking the reinforcement or escape of troops or provision of supplies (a tactic known as "investment"), typically coupled with attempts to reduce the fortifications by means of siege engines, artillery bombardment, mining (also known as sapping), or the use of deception or treachery to bypass defences. Failing a military outcome, sieges can often be decided by starvation, thirst or disease, which can afflict either the attacker or defender. Sieges probably predate the development of cities as large population centres. Ancient cities in the Middle East show archaeological evidence of having had fortified city walls. During the Warring States era of ancient China, there is both textual and archaeological evidence of prolonged sieges and siege machinery used against the defenders of city walls. Siege machinery was also a tradition of the ancient Greco-Roman world. During the Renaissance and the Early Modern period, siege warfare dominated the conduct of war in Europe. Leonardo da Vinci gained as much of his renown from the design of fortifications as from his artwork. The Assyrians deployed large labour forces to build new palaces, temples and defensive walls. Some settlements in the Indus Valley Civilization were also fortified. By about 3500 BC, hundreds of small farming villages dotted the Indus River floodplain. Many of these settlements had fortifications and planned streets. City walls and fortifications were essential for the defence of the first cities in the ancient Near East. The walls were built of mud bricks, stone, wood or a combination of these materials depending on local availability. They may also have served the dual purpose of showing presumptive enemies the might of the kingdom. The great walls surrounding the Sumerian city of Uruk gained a widespread reputation. The walls were 9.5 km (5.9 mi) in length, and up to 12 m (39 ft) in height. Later, the walls of Babylon, reinforced by towers, moats and ditches, gained a similar reputation. In Anatolia, the Hittites built massive stone walls around their cities, taking advantage of the hillsides. In Shang Dynasty China, at the site of Ao, large walls were erected in the 15th century BC that had dimensions of 20 m (66 ft) in width at the base and enclosed an area of some 2,100 yards (1,900 m) squared. The ancient Chinese capital for the State of Zhao, Handan, founded in 386 BC, also had walls that were 20 m (66 ft) wide at the base; they were 15 m (49 ft) tall, with two separate sides of its rectangular enclosure at a length of 1,530 yd (1,400 m). The cities of the Indus Valley Civilization showed less effort in constructing defences, as did the Minoan civilization on Crete. These civilizations probably relied more on the defence of their outer borders or sea shores. Unlike the ancient Minoan civilization, the Mycenaean Greeks emphasized the need for fortifications alongside natural defences of mountainous terrain, such as the massive Cyclopean walls built at Mycenae during the last half of the 2nd millennium BC. The late 9th-century BC siege system surrounding Tell es-Safi/Gath, Israel, consists of a 2.5 km long siege trench, towers and other elements, and is the earliest evidence of a circumvallation system known in the world. It was apparently built by Hazael of Aram Damascus, as part of his siege and conquest of Philistine Gath in the late 9th century BC (mentioned in II Kings 12:18). In ancient China, sieges of city walls (along with naval battles) were portrayed on bronze 'hu' vessels, like those found in Chengdu, Sichuan in 1965 which have been dated to the Warring States period (5th to 3rd centuries BC). The most common practice of siege warfare was to lay siege and just wait for the surrender of the enemies inside, or quite commonly, to coerce someone inside to betray the fortification. During a siege a surrounding army would build earthworks (a line of circumvallation) to completely encircle their target, preventing food, water, and other supplies from reaching the besieged city. If sufficiently desperate as the siege progressed, defenders and civilians might have been reduced to eating anything vaguely edible - horses, family pets, the leather from shoes, and even each other. 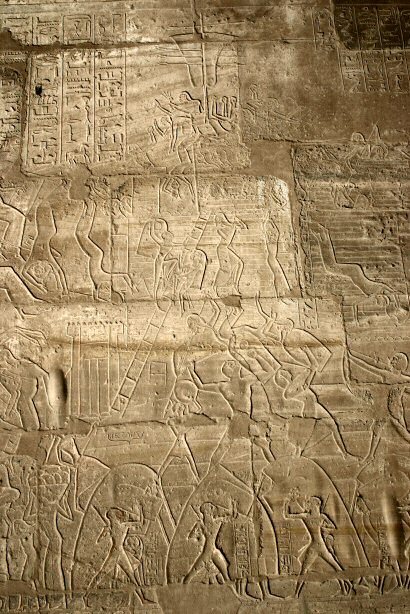 The Egyptian siege of Megiddo in the 15th century BC lasted for 7 months before its inhabitants surrendered. The Hittite siege of a rebellious Anatolian vassal in the 14th century BC ended when the queen mother came out of the city and begged for mercy on behalf of her people. The Hittite campaign against the kingdom of Mitanni in the 14th century BC bypassed the fortified city of Carchemish. If the main objective of a campaign was not the conquest of a particular city, it could simply be passed by. When the main objective of the campaign had been fulfilled, the Hittite army returned to Carchemish and the city fell after an eight-day siege. The well-known Assyrian Siege of Jerusalem in the 8th century BC came to an end when the Israelites bought them off with gifts and tribute, according to the Assyrian account, or when the Assyrian camp was struck by mass death, according to the Biblical account. Due to logistics, long-lasting sieges involving a minor force could seldom be maintained. A besieging army, encamped in possibly squalid field conditions and dependant on the countryside and its own supply lines for food, could very well be threatened with the disease and starvation intended for the besieged. To end a siege more rapidly various methods were developed in ancient and medieval times to counter fortifications, and a large variety of siege engines were developed for use by besieging armies. Ladders could be used to escalade over the defences. Battering rams and siege hooks could also be used to force through gates or walls, while catapults, ballistae, trebuchets, mangonels, and onagers could be used to launch projectiles in order to break down a city's fortifications and kill its defenders. A siege tower, a substantial structure built to equal or greater height than the fortification's walls, could allow the attackers to fire down upon the defenders and also advance troops to the wall with less danger than using ladders. Disease was another effective siege weapon, although the attackers were often as vulnerable as the defenders. In some instances, catapults or similar weapons were used to fling diseased animals over city walls in an early example of biological warfare. If all else failed, a besieger could claim the booty of his conquest undamaged, and retain his men and equipment intact, for the price of a well-placed bribe to a disgruntled gate-keeper. The philosophically-pacifist Mohists (followers of the philosopher Mozi) of the 5th century BC believed in aiding the defensive warfare of smaller Chinese states against the hostile offensive warfare of larger domineering states. The Mohists were renowned in the smaller states (and the enemies of the larger states) for the inventions of siege machinery to scale or destroy walls. These included traction trebuchet catapults, eight-foot-high ballistas, a wheeled siege ramp with grappling hooks known as the Cloud Bridge (the protractable, folded ramp slinging forward by means of a counterweight with rope and pulley), and wheeled 'hook-carts' used to latch large iron hooks onto the tops of walls to pull them down. Advances in the prosecution of sieges in ancient and medieval times naturally encouraged the development of a variety of defensive counter-measures. In particular, medieval fortifications became progressively stronger—for example, the advent of the concentric castle from the period of the Crusades—and more dangerous to attackers—witness the increasing use of machicolations and murder-holes, as well the preparation of hot or incendiary substances. Arrow slits (also called arrow loops or loopholes), sally ports (airlock-like doors) for sallies, and deep water wells were also integral means of resisting siege at this time. Particular attention would be paid to defending entrances, with gates protected by drawbridges, portcullises and barbicans. Moats and other water defences, whether natural or augmented, were also vital to defenders. In the European Middle Ages, virtually all large cities had city walls—Dubrovnik in Dalmatia is an impressive and well-preserved example—and more important cities had citadels, forts or castles. Great effort was expended to ensure a good water supply inside the city in case of siege. In some cases, long tunnels were constructed to carry water into the city. Complex systems of underground tunnels were used for storage and communications in medieval cities like Tábor in Bohemia, similar to those used much later in Vietnam during the Vietnam War. Alexander the Great's Macedonian army successfully besieged many powerful cities during his astounding conquests. Two of his most impressive achievements in siegecraft took place in the Siege of Tyre and the Siege of the Sogdian Rock. His engineers built a causeway that was originally 60 m (200 ft) wide and reached the range of his torsion-powered artillery, while his soldiers pushed siege towers housing stone throwers and light catapults to bombard the city walls. Most conquerors before him had found Tyre, a Phoenician island-city about 1 km from the mainland, impregnable. The Macedonians built a mole, a raised spit of earth across the water, by piling stones up on a natural land bridge that extended underwater to the island, and although the Tyrians rallied by sending a fire-ship to destroy the towers, and captured the mole in a swarming frenzy, the city eventually fell to the Macedonians after a seven-month siege. In complete contrast to Tyre, Sogdian Rock was captured by stealthy attack. Alexander used commando-like tactics to scale the cliffs and capture the high ground, and the demoralized defenders surrendered. In his Commentarii de Bello Gallico (Commentaries on the Gallic War), Caesar describes how at the Battle of Alesia the Roman legions created two huge fortified walls around the city. The inner circumvallation, 10 miles (16 km), held in Vercingetorix's forces, while the outer contravallation kept relief from reaching them. The Romans held the ground in between the two walls. The besieged Gauls, facing starvation, eventually surrendered after their relief force met defeat against Caesar's auxiliary cavalry. The Sicarii Zealots who defended Masada in AD 73 were defeated by the Roman legions who built a ramp 100 m high up to the fortress's west wall. "By concentrating on the field armies, the strongholds had to wait. Of course, smaller fortresses, or ones easily surprised, were taken as they came along. This had two effects. First, it cut off the principal city from communicating with other cities where they might expect aid. Secondly, refugees from these smaller cities would flee to the last stronghold. The reports from these cities and the streaming hordes of refugees not only reduced the morale of the inhabitants and garrison of the principal city, it also strained their resources. Food and water reserves were taxed by the sudden influx of refugees. Soon, what was once a formidable undertaking became easy. The Mongols were then free to lay siege without interference of the field army as it had been destroyed... At the siege of Aleppo, Hulagu used twenty catapults against the Bab al-Iraq (Gate of Iraq) alone. In Jûzjânî, there are several episodes in which the Mongols constructed hundreds of siege machines in order to surpass the number which the defending city possessed. While Jûzjânî surely exaggerated, the improbably high numbers which he used for both the Mongols and the defenders do give one a sense of the large numbers of machines used at a single siege." Another Mongol tactic was to use catapults to launch corpses of plague victims into besieged cities. The disease-carrying fleas from the bodies would then infest the city, and the plague would spread allowing the city to be easily captured, although this transmission mechanism was not known at the time. In 1346 the bodies of Mongol warriors of the Golden Horde who had died of plague were thrown over the walls of the besieged Crimean city of Kaffa (now Feodosiya). It has been speculated that this operation may have been responsible for the advent of the Black Death in Europe. The Black Death is estimated to have killed 30% – 60% of Europe's population. However, the Chinese were not completely defenceless, and from AD 1234 until 1279 the Southern Song Chinese held out against the enormous barrage of Mongol attacks. Much of this success in defense lay in the world's first use of gunpowder (i.e. with early flamethrowers, grenades, firearms, cannons, and land mines) to fight back against the Khitans, the Tanguts, the Jurchens, and then the Mongols. During the Ming Dynasty (AD 1368–1644), the Chinese were very concerned with city planning in regards to gunpowder warfare. The site for constructing the walls and the thickness of the walls in Beijing's Forbidden City were favoured by the Chinese Yongle Emperor (r. 1402–1424), because they were in pristine position to resist cannon volley and were built thick enough to withstand attacks from cannon fire. The introduction of gunpowder and the use of cannons brought about a new age in siege warfare. Cannons were first used in Song Dynasty China during the early 13th century, but did not become significant weapons for another 150 years or so. By the 16th century, they were an essential and regularized part of any campaigning army, or castle's defences. The greatest advantage of cannons over other siege weapons was the ability to fire a heavier projectile, further, faster and more often than previous weapons. They could also fire projectiles in a straight line, so that they could destroy the bases of high walls. Thus, 'old fashioned' walls - that is high and, relatively, thin - were excellent targets and, over time, easily demolished. In 1453, the great walls of Constantinople, the capital of the Byzantine Empire, were broken through in just six weeks by the 62 cannons of Mehmet II's army. Once siege guns were developed the techniques for assaulting a town or a fortress became well known and ritualized. The attacking army would surround a town. Then the town would be asked to surrender. If they did not comply the besieging army would surround the town with temporary fortifications to stop sallies from the stronghold or relief getting in. The attackers would then build a length of trenches parallel to the defences (these are known as the "First parallel") and just out of range of the defending artillery. They would then dig a trench (known as a Forward) towards the town in a zigzag pattern so that it could not be enfiladed by defending fire. Once within artillery range another parallel (the Second Parallel) trench would be dug with gun emplacements. This technique is commonly called Entrenchment. The most effective way to protect walls against cannon fire proved to be depth (increasing the width of the defences) and angles (ensuring that attackers could only fire on walls at an oblique angle, not square on). Initially walls were lowered and backed, in front and behind, with earth. Towers were reformed into triangular bastions. This design matured into the trace italienne. Star-shaped fortresses surrounding towns and even cities with outlying defences proved very difficult to capture, even for a well equipped army. Fortresses built in this style throughout the 16th century did not become fully obsolete until the 19th century, and were still in use throughout World War I (though modified for 20th-century warfare). During World War II trace italienne fortresses could still present a formidable challenge, for example in the last days of World War II, during the Battle in Berlin that saw some of the heaviest urban fighting of the war, the Soviets did not attempt to storm the Spandau Citadel (built between 1559 and 1594) but chose to invest it and negotiate its surrender. In the 1530s and 1540s, the new style of fortification began to spread out of Italy into the rest of Europe, particularly to France, the Netherlands, and Spain. Italian engineers were in enormous demand throughout Europe, especially in war-torn areas such as the Netherlands, which became dotted by towns encircled in modern fortifications. The densely populated areas of Northern Italy and the United Provinces (the Netherlands) were infamous for their high degree of fortification of cities. It made campaigns in these areas very hard to successfully conduct, considering even minor cities had to be captured by siege within the span of the campaigning season. In the Dutch case, the possibility of flooding large parts of the land provided an additional obstacle to besiegers, for example at the Siege of Leiden. For many years, defensive and offensive tactics were well balanced leading to protracted and costly wars such as Europe had never known, involving more and more planning and government involvement. The new fortresses ensured that war rarely extended beyond a series of sieges. Because the new fortresses could easily hold 10,000 men, an attacking army could not ignore a powerfully fortified position without serious risk of counterattack. As a result, virtually all towns had to be taken, and that was usually a long, drawn-out affair, potentially lasting from several months to years, while the members of the town were starved to death. Most battles in this period were between besieging armies and relief columns sent to rescue the besieged. At the end of the 17th century, two influential military engineers, the French Marshal Vauban and the Dutch military engineer Menno van Coehoorn, developed modern fortification to its pinnacle, refining siege warfare without fundamentally altering it: ditches would be dug; walls would be protected by glacis; and bastions would enfilade an attacker. Both engineers developed their ideas independently but came to similar general rules regarding defensive construction and offensive action against fortifications. Both were skilled in conducting sieges and defences themselves. Before Vauban and Van Coehoorn, sieges had been somewhat slapdash operations. Vauban and Van Coehoorn refined besieging to a science with a methodical process that, if uninterrupted, would break even the strongest fortifications. Examples of their styles of fortifications are Arras (Vauban) and the no-longer existent fortress of Bergen op Zoom (Van Coehoorn). The main differences between the two lay in the difference in terrain on which Vauban and Van Coehoorn constructed their defences: Vauban in the sometimes more hilly and mountainous terrain of France, Van Coehoorn in the flat and floodable lowlands of the Netherlands. This would be the first construction effort of a besieging army, built soon after a fortress or city had been invested. A line of circumvallation would also be constructed, facing in towards the besieged area, to protect against sorties by the defenders and to prevent the besieged from escaping. The next line, which Vauban usually placed at about 600 meters from the target, would contain the main batteries of heavy cannons so that they could hit the target without being vulnerable themselves. Once this line was established, work crews would move forward creating another line at 250 meters. This line contained smaller guns. The final line would be constructed only 30 to 60 meters from the fortress. This line would contain the mortars and would act as a staging area for attack parties once the walls were breached. Van Coehoorn developed a small and easily movable mortar named the coehorn, variations of which were used in sieges until the 19th century. It would also be from this line that miners working to undermine the fortress would operate. Another element of a fortress was the citadel. Usually a citadel was a "mini fortress" within the larger fortress, sometimes designed as a reduit, but more often as a means of protecting the garrison from potential revolt in the city. The citadel was used in wartime and peacetime to keep the residents of the city in line. An important element of strategy for the besieging army was whether or not to allow the encamped city to surrender. Usually it was preferable to graciously allow a surrender, both to save on casualties, and to set an example for future defending cities. A city that was allowed to surrender with minimal loss of life was much better off than a city that held out for a long time and was brutally butchered at the end. Moreover, if an attacking army had a reputation of killing and pillaging regardless of a surrender, then other cities' defensive efforts would be redoubled. Usually a city would surrender (with no honour lost) when its inner lines of defence were reached by the attacker. In case of refusal however, the inner lines would have to be stormed by the attacker and the attacking troops would be seen to be justified in sacking the city. Siege warfare dominated in Western Europe for most of the 17th and 18th centuries. An entire campaign, or longer, could be used in a single siege (for example, Ostend in 1601–04; La Rochelle in 1627–28). This resulted in extremely prolonged conflicts. The balance was that while siege warfare was extremely expensive and very slow, it was very successful—or, at least, more so than encounters in the field. Battles arose through clashes between besiegers and relieving armies, but the principle was a slow grinding victory by the greater economic power. The relatively rare attempts at forcing pitched battles (Gustavus Adolphus in 1630; the French against the Dutch in 1672 or 1688) were almost always expensive failures. The exception to this rule were the English. During the English Civil War anything which tended to prolong the struggle, or seemed like want of energy and avoidance of a decision, was bitterly resented by the men of both sides. In France and Germany, the prolongation of a war meant continued employment for the soldiers, but in England both sides were looking to end the war quickly. Even when in the end the New Model Army—a regular professional army—developed the original decision-compelling spirit permeated the whole organisation as was seen when pitched against regular professional continental troops the Battle of the Dunes during the Interregnum. Experienced commanders on both sides in the English Civil War recommended the abandonment of garrisoned fortifications for two primary reasons. The first, as for example proposed by the Royalist Sir Richard Willis to King Charles, was that by abandoning the garrisoning of all but the most strategic locations in ones own territory, far more troops would be available for the field armies and it was the field armies which would decide the conflict. The other argument was that by slighting potential strong points in ones own territory, an enemy expeditionary force, or local enemy rising, would find it more difficult to consolidate territorial gains against an inevitable counterattack. Sir John Meldrum put forward just such an argument to the Parliamentary Committee of Both Kingdoms, to justify his slighting of Gainsborough in Lincolnshire. Sixty years later during the War of the Spanish Succession the Duke of Marlborough preferred to engage the enemy in pitched battles rather than engage in siege warfare, although he was very proficient in both types of warfare. On 15 April 1746, the day before the Battle of Culloden, at Dunrobin Castle, a party of the William Sutherland, 17th Earl of Sutherland's militia conducted the last siege fought on the mainland of Great Britain against Jacobin members of clan MacLeod. Advances in artillery made previously impregnable defences useless. For example, the walls of Vienna that had held off the Turks in the mid-17th century were no obstacle to Napoleon in the late 18th. During the Franco-Prussian War, the battlefield front-lines moved rapidly through France. However, the Prussian and other German armies were delayed for months at the Siege of Metz and the Siege of Paris, due to the greatly increased firepower of the defending infantry, and the principle of detached or semi-detached forts with heavy-caliber artillery. This resulted in the later construction of fortress works across Europe such as the massive fortifications at Verdun. It also led to the introduction of tactics which sought to induce surrender by bombarding the civilian population within a fortress rather than the defending works themselves. The Siege of Sevastopol (1854–1855) during the Crimean War and the Siege of Petersburg (1864–1865) during the American Civil War showed that modern citadels, when improved by improvised defences, could still resist an enemy for many months. The Siege of Plevna during the Russo-Turkish War (1877–1878) proved that hastily-constructed field defences could resist attacks prepared without proper resources, and were a portent of the trench warfare of World War I. Advances in firearms technology without the necessary advances in battlefield communications gradually led to the defence again gaining the ascendancy. An example of siege during this time, prolonged during 337 days due to the isolation of the surrounded troops, was the Siege of Baler, in which a reduced group of Spanish soldiers, was besieged in a small church by the Philippine rebels, in the course of the Philippine Revolution and the Spanish–American War, until months after the Treaty of Paris, the end of the conflict. This sepoy POW shows the conditions of the garrison at Kut at the end of the siege in the First World War. More traditional sieges of fortifications took place in addition to trench sieges. The Siege of Tsingtao was one of the first major sieges of the war, but the inability for significant resupply of the German garrison made it a relatively one-sided battle. The Germans and the crew of an Austro-Hungarian protected cruiser put up a hopeless defence and after holding out for more than a week surrendered to the Japanese, forcing the German East Asia Squadron to steam towards South America for a new coal source. The other major siege outside Europe during the First World War was in Mesopotamia, at the Siege of Kut. After a failed attempt to move on Baghdad, stopped by the Ottomans at the bloody Battle of Ctesiphon, the British and their large contingent of Indian sepoy soldiers were forced to retreat to Kut, where the Ottomans under German General Baron Colmar von der Goltz laid siege. The British attempts to resupply the force via the Tigris river failed, and rationing was complicated by the refusal of many Indian troops to eat cattle products. By the time the garrison fell on 29 April 1916, starvation was rampant. Conditions did not improve greatly under Turkish imprisonment. Along with the Battle of Tanga, the Battle of Sandfontein, the Battle of Gallipoli and the Battle of Namakura, it would be one of Britain's numerous embarrassing colonial defeats of the war. The largest sieges of the war, however, took place in Europe. The initial German advance into Belgium produced four major sieges, the Battle of Liege, the Battle of Namur, the Siege of Maubeuge and the Siege of Antwerp. All three would prove crushing German victories, at Liege and Namur against the Belgians, at Maubeuge against the French and at Antwerp against a combined Anglo-Belgian force. The weapon that made these victories possible were the German Big Berthas and the Skoda 305 mm Model 1911 siege mortars, one of the best siege mortars of the war, on loan from Austria-Hungary. These huge guns were the decisive weapon of siege warfare in the 20th century, taking part at Przemyśl, the Belgian sieges, on the Italian Front and Serbian Front, and even being reused in World War II. At the second Siege of Przemyśl, the Austro-Hungarian garrison showed an excellent knowledge of siege warfare, not only waiting for relief, but sending sorties into Russian lines and employing an active defence that resulted in the capture of the Russian General Lavr Kornilov. Despite its excellent performance, the garrison's food supply had been requisitioned for earlier offensives, a relief expedition was stalled by the weather, ethnic rivalries flared up between the defending soldiers and a breakout attempt failed. When the commander of the garrison Hermann Kusmanek finally surrendered, his troops were eating their horses and the first attempt of large-scale air supply had failed. It was one of the few great victories obtained by either side during the war; 110,000 Austro-Hungarian prisoners were marched back to Russia. Use of aircraft for siege running, bringing supplies to areas under siege, would nevertheless prove useful in many sieges to come. The largest siege of the war, and the arguably the roughest, most gruesome battle in history, was the Battle of Verdun. Whether the battle can be considered true siege warfare is debatable. Under the theories of Erich von Falkenhayn it is more distinguishable as purely attrition with a coincidental presence of fortifications on the battlefield. When considering the plans of Crown Prince Wilhelm, purely concerned with taking the citadel and not with French casualty figures, it can be considered a true siege. The main fortifications were Fort Douaumont, Fort Vaux and the fortified city of Verdun itself. The Germans, through the use of huge artillery bombardments, flamethrowers and infiltration tactics were able to capture both Vaux and Douaumont, but were never able to take the city, and eventually lost most of their gains. It was a battle that, despite the French ability to fend off the Germans, neither side won. The German losses were not worth the potential capture of the city and the French casualties were not worth holding the symbol of her defence. The Blitzkrieg of the Second World War truly showed that fixed fortifications are easily defeated by manoeuvre instead of frontal assault or long sieges. The great Maginot Line was bypassed and battles that would have taken weeks of siege could now be avoided with the careful application of air power (such as the German paratrooper capture of Fort Eben-Emael, Belgium, early in World War II). Map showing Axis encirclement of Leningrad (1942-43). 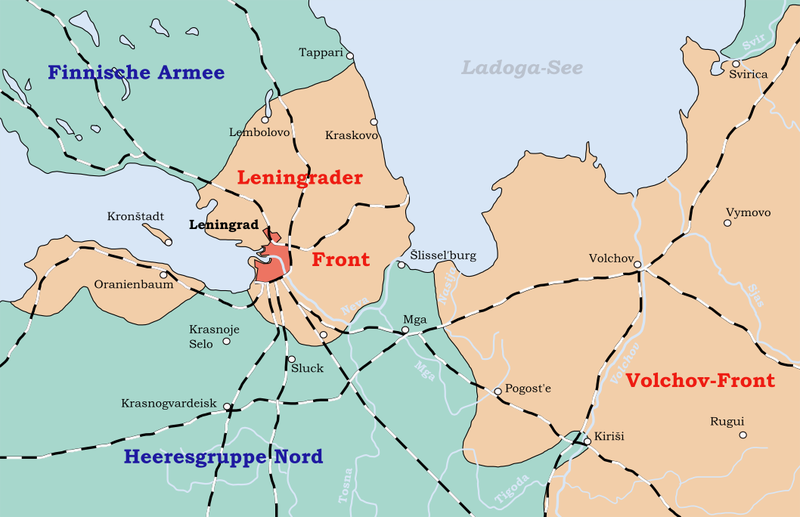 The most important siege was the Siege of Leningrad, that lasted over 29 months, about half of the duration of the entire Second World War. Along with the Battle of Stalingrad, the Siege of Leningrad on the Eastern Front was the deadliest siege of a city in history. In the west, apart from the Battle of the Atlantic the sieges were not on the same scale as those on the European Eastern front; however, there were several notable or critical sieges: the island of Malta, for which the population won the George Cross, Tobruk. In the South-East Asian Theatre there was the siege of Singapore and in the Burma Campaign sieges of Myitkyina, the Admin Box, Imphal and Kohima which was the high-water mark for the Japanese advance into India. The airbridge methods which were developed and used extensively in the Burma Campaign for supplying the Chindits and other units, including those in sieges such as Imphal, as well as flying the Hump into China, allowed the western powers to develop air lift expertise which would prove vital during the Cold War Berlin Blockade. Air supply failed to prevent the fall of Dien Bien Phu to the Vietnamese in 1954 but proved crucial in maintaining the American base at Khe Sanh in 1968. During the Vietnam War the battles of Dien Bien Phu (1954) and Khe Sanh (1968) possessed siege-like characteristics. In both cases, the Viet Minh and NLF were able to cut off the opposing army by capturing the surrounding rugged terrain. At Dien Bien Phu, the French were unable to use air power to overcome the siege and were defeated. However, at Khe Sanh a mere 14 years later, advances in air power - and a reduction in Vietnamese anti-aircraft capability - allowed the United States to withstand the siege. The resistance of US forces was assisted by the PAVN and PLAF forces' decision to use the Khe Sanh siege as a strategic distraction to allow their mobile warfare offensive, the first Tet Offensive, to unfold securely. The Siege of Khe Sanh displays typical features of modern sieges, as the defender has greater capacity to withstand the siege, the attacker's main aim is to bottle operational forces or create a strategic distraction, rather than take the siege to a conclusion. In neighbouring Cambodia, at that time known as the Khmer Republic, the Khmer Rouge used siege tactics to cut off supplies from Phnom Penh to other government-held enclaves in an attempt to break the will of the government to continue fighting. In 1972 the Easter offensive, the Siege of An Lộc Vietnam occurred. ARVN troops and U.S. advisers and air power successfully defeated communist forces. The Battle of An Lộc pitted some 6,350 ARVN men against a force three times that size. During the peak of the battle, ARVN had access to only one 105 mm howitzer to provide close support while the enemy attack was backed by an entire artillery division. ARVN had no tanks, the NVA communist forces had two armoured regiments. ARVN prevailed after over two months of continuous fighting. As General Paul Vanuxem, a French veteran of the Indochina War, wrote in 1972 after visiting the liberated city of An Lộc: "An Lộc was the Verdun of Vietnam, where Vietnam received as in baptism the supreme consecration of her will." Siege tactics continue to be employed in police conflicts. This has been due to a number of factors, primarily risk to life, whether that of the police, the besieged, bystanders or hostages. Police make use of trained negotiators, psychologists and, if necessary, force, generally being able to rely on the support of their nation's armed forces if required. The 1993 police siege on the Branch Davidian church in Waco, Texas, lasted 51 days, an atypically long police siege. Unlike traditional military sieges, police sieges tend to last for hours or days rather than weeks, months or years. In Britain, if the siege involves perpetrators who are considered by the British Government to be terrorists, and if an assault is to take place, the civilian authorities hand command and control over to the military. The threat of such an action ended the Balcombe Street Siege in 1975 but the Iranian Embassy Siege in 1980 ended in a military assault and the deaths of all but one of the hostage takers. ↑ 9.0 9.1 Ebrey 2006, p. 29. Alchon, Suzanne Austin (2003). A pest in the land: new world epidemics in a global perspective. University of New Mexico Press. p. 21. ISBN 0-8263-2871-7. http://books.google.com/?id=YiHHnV08ebkC&pg=PA21&dq#v=onepage&q=&f=false. Firth, C. H. (1902). Cromwell's Army: A History of the English Soldier During the Civil Wars, the Commonwealth and the Protectorate. Sussex: Methurn & Company. p. 29. http://www.archive.org/details/cromwellsarmyhis00firtuoft. Ebrey, Walthall, Palais (2006). East Asia: A Cultural, Social, and Political History. Boston: Houghton Mifflin Company. ISBN ????. Grousset, René (1970). The Empire of the Steppes: A History of Central Asia. Rutgers University Press. p. 362. ISBN 0-8135-1304-9. http://books.google.com/?id=CHzGvqRbV_IC&pg=PA362&dq=siege+of+aleppo+catapult#v=onepage&q&f=false. Hoskin, John, Carol Howland (2006). Vietnam. New Holland Publishers. pp. 105. ISBN ????. http://books.google.com/?id=ZHn_8ihziN8C&pg=PA105&dq=underground+system+vietnam#v=onepage&q&f=false. Morocco, John (1984). Thunder from Above: Air War, 1941-1968. Boston: Boston Publishing Company. Reynolds, Francis Joseph; Churchill, Allen Leon; Miller, Francis Trevelyan (1916). The story of the great war: history of the European War from official sources; complete historical records of events to date. P.F. Collier & Son. p. 406. http://books.google.com/?id=X6RCAAAAYAAJ&q=Skoda+gun+is+reputed+to+be+the+best&dq=Skoda+gun+is+reputed+to+be+the+best. Roland, Alex (1992). "Secrecy, Technology, and War: Greek Fire and the Defense of Byzantium, Technology and Culture". pp. 655–679. Digital object identifier:10.2307/3106585. ISBN ????. Symonds, Richard (1859). Long, Charles Edward. ed. Diary of the marches of the royal army during the great civil war. Works of the Camden Society. 74. The Camden Society page=270. Townshend, Charles (2000). The Oxford History of Modern War. Oxford University Press. pp. 211,212. ISBN 0-19-285373-2. Turnbull, Stephen R. (2002). Siege Weapons of the Far East. Oxford: Osprey Publishing Ltd. ISBN ????. Wheelis, M. (2002). "Biological warfare at the 1346 siege of Caffa". Center for Disease Control. http://www.cdc.gov/ncidod/EID/vol8no9/01-0536.htm. Lynn, John A. (1999). The Wars of Louis XIV. Pearson. http://www.amazon.com/Wars-Louis-XIV-1667-1714/dp/0582056292/. May, Timothy. (27 June 2004). "Mongol Arms". Explorations in Empire, Pre-Modern Imperialism Tutorial: the Mongols. University of Wisconsin-Madison. http://www.accd.edu/sac/history/keller/Mongols/empsub2.html. Ostwald, Jamel (2007). Vauban Under Siege: Engineering Efficiency and Martial Vigor in the War of the Spanish Succession. History of Warfare. 41 (illustrated ed.). BRILL. http://books.google.com/books?id=-rZX8-tgjrUC&lpg=PP1&pg=PR7#v=onepage&q&f=false.